Sugar In Peanut Butter: What Type Of Sugar Are You Eating? Digesting The Label is a series that takes a look at what exactly is in the food that we're buying and eating from a nutritional standpoint. Every two weeks, we'll examine a food and help determine whether or not it's all it's cut out to be .. or in some cases, even better for us than we thought. This week, we're looking at the types of sugar in peanut butter. We've already covered the area of added sugar when it comes to jam, so naturally, peanut butter is next on the chopping board. What you will find about most store-bought peanut butters is that when it comes to nutrition, they are basically all the same. Yes, there are only a few big brands out there, but looking at sugar, fat and calories, you're looking at the same amount for 1 tbsp (or roughly 15 grams). But what's in your jar when it comes to sugar? Most big brands are made with added white sugar, but there are other options with dried cane syrup, agave syrup or coconut palm sugar. Abby Langer, a registered dietitian based in Toronto, says at the end of the day, all sugar is still sugar. "White sugar is the most refined, while palm sugar and cane juice are less refined and are lower in the glycemic index," she says, adding that these sugars won't raise blood sugar as quickly as the white stuff. But Langer adds sometimes it's not just sugar you have to watch out for. Typically, when you are shopping for peanut butter, look for brands with no additives or added sugar. And if you have a hard time getting used to the taste of plain peanut butter, Langer suggests trying another nut butter like hazelnut butter, for example (no, not Nutella). This week, instead of ranking peanut butters, we took a look at the types of sugar each one contains. 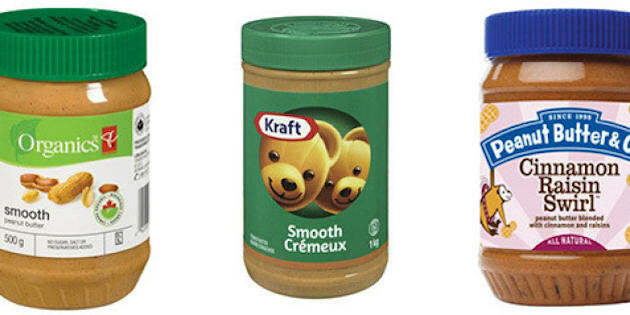 Let us know, which peanut butter brand do you love the most? And to keep things interesting, we've included flavoured versions as well.